YES! Everything is as Easy as Yes | GetAlongWithGod.comGetAlongWithGod | A blog about discovering a God worth knowing. Here is a thought I am pondering: Where my yes merges with God’s Yes, there the resurrected Life of the Son flows. I am seeing something so amazing and wonderful. In the past I’ve believed falsely that this life is hard. Moreover that the Christian life and cross life were only a struggle and strain. These old beliefs rooted in my psyche became a belief system that robbed me of joy. Unfortunately, I know of more pinched-faced Christians than joy-filled victors. And I know why! First, let me tell you how effortless the Christian life can be. That’s it, just a yes! How, you might ask? Well God doesn’t look to my life for performance. My performance of His Will is a recipe for destruction. As I have said in my previous posts: Christ’s life as my life is His life in my life, and that’s not my life as His life. Now say that three times fast – hahaha! God asks us many things. He comes to us and gives us many choices. When He says, “I want you to do so and so,” it’s not a conscripting of me to go to work; it is an asking of me for the permission to BE that in me. I have the choice to say yes or no. Where I feel many get hung up is in the DOING. Okay, let’s take an example out of my life. I heard God’s call to singleness, but I can’t do that. My attempts to perform this will only lead to my laws and my failure. I will stumble and fall at every turn. No, my call to celibacy is an invitation to see Christ be celibate in me, through me. Here is a visual I got while swimming today. Say you throw a baby into the pool. If that baby has not been trained, they will flail for a bit and then sink to the bottom. (Attention: No babies were harmed in the making of this example!) Now, if you’ve taught that baby to flip over and float, they remain buoyant on top of the water. Well, we in the Christian life are very similar. Life is like the pool, my attempts to save myself by flailing are similar to my efforts to perform this life, and my YES to His Life is like floating buoyant on the waters. Very simplistic visual, I know, but so can the Christian life be. What if we simply, whole-heartedly opened our lives up to God when He poised something to us? What if we just heard and said YES. Take anything in our life that God is asking of us. Respond, “YES, Father, I surrender to Your life to perform that in me. 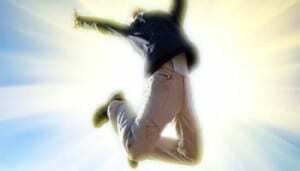 Yes, I want to see that.” Now, He is free to accomplish that in us. This isn’t an exercise in irresponsibility, this is the most responsible thing we can do. Does that mean I can always escape a painful Gethsemane? No! But here is the good news, Christ Himself performed this before us as an example. It is one thing to say yes to His performing a job or work of character, and quite another to have to embrace a death to see that work done—but Jesus showed us the way. “Father, if you are willing, please take this cup of suffering away from me. Yet I want your will to be done, not mine” (Luke 22:42). He said His YES to the Father, and it was God’s to perform. So whether it’s a life calling, or surrendering to a situation, or developing a character, everything He asks of us, He gets to do. EVERYTHING – but the yes. • Monday, I will go into the merging of His Yes and my yes. Well said, John. “Everything but the yes”. Also, had to laugh 😂 along with you on the previous posts example: Christ’s life as my life is His life in my life,…. Try to commit that to memory. Thanks and have a great day! Oh, my! I’m overwhelmed by the simplicity and freedom of this! Thank you! It excites me that it is. I so want it to to be simple because I think Christ Himself taught things simply. Basically if we’d be a child He makes it so clear. It has only been when I wanted to be smartly adult that the whole thing fell apart. Blessing and loving you Anna! Thank you for celebrating this with me. I recently watched a new film by Ibetheltv titled Compelled by Love featuring the story of Rolland and Heidi Baker and their ministry. One thing that was said over and over about Heidi and Rolland was that they never told God no, they always said, “Yes”. Their sacrifice of love and faith has born and is bearing the fruit of Christ and His Kingdom. It is a must watch film! Christ’s life as my life is His life in my life, and that’s not my life as His life! John, does it count when i can write it fast :)? But to be serious: It took me 35 years to learn I don’t need to do it! And then I understood, how much I stood in His way! When I take things out of God’s hands, He will let me take them. Then His hands are empty. How could I ever see Him perform His wonders in my life if I won’t let Him? With teary eyes, I say thank you, thank you thank you! This has been very helpful! I really appreciate these blogs! His joy comes in the morning. I say Yes Lord, Yes Lord , Yes, Yes Lord AMEN!